Why risk Pentosin® leaks into your engine bay or down the bumper. This is the ONLY economical and permanent solution for a fully functional wing! Your dealer wants over $3000 to install a replacement hydraulic mechanism. Our patented 996 Turbo electric eRam Kit™ consists of two pre-assembled electric rams that simply bolt onto the engine lid with absolutely NO modifications, and a tiny “MicroModule Device™” that connects to the factory wiring. Nearly plug and play! The kit includes all necessary hardware and illustrated step by step instructions are sent with your order. Works exactly like the factory mechanism. Upgrade from the troublesome factory hydraulic mechanism to the simpler, lighter, yet more robust eRam Kit™. Available in 4 heights – and NOW you can finally install a 997 Turbo Wing on your 996 Turbo! The eRam Kit™ consists of two self-contained electric rams with all fasteners, electrical connections and the tiny MicroModule Device™ which prevents the spoiler warning. No cutting, drilling or modification of any part of the car. Nearly plug and play! Easy installation. Easily maintained – no special tools needed. Easily modified (for instance to upgrade to taller rams or add Dust & Moisture Boots). HEAVY DUTY, self-contained yet light weight electric rams have two built in limit switches in each ram – greatly reducing the risk of failure. 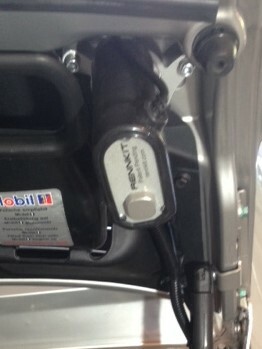 Works exactly like the factory system; extends by using the dash switch or upon reaching 75 MPH (100 K/h). Retracts with the dash switch, or upon slowing to 37 MPH (5 K/h). COST EFFECTIVE – the patented eRam Kit™ is far cheaper than a new factory mechanism- and will NEVER leak or fail due to the multiple problems associated with the hydraulic design. We carefully identified 13 failure points which can be reviewed HERE. Installation of the eRam Kit™ takes about 2 hours for anyone with mechanical skills. If you have ever changed brake pads, you can easily handle an eRam Kit™ installation. Most customers install the eRam Kit™ themselves. 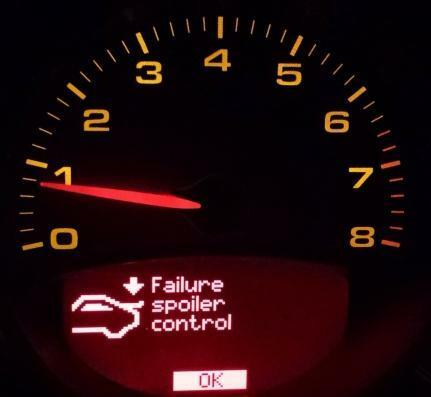 No major electrical modifications – the tiny MicroModule Device™ prevents the dreaded SPOILER FAILURE WARNING by communicating with the car’s computer. Our flagship 4 3/4” [119 mm] eRam Kit™ provides SUPERIOR aerodynamic downforce, as the wing is up higher in cleaner air – just like the factory GT2, GT3 and GT4 wings. Improves rear wheel down force at higher speed. This eRam Kit™ raises the wing 4 3/4” above the parked position when deployed. For the 996 Turbo coupe, a full 2.4” [54 mm] above the factory raised height. 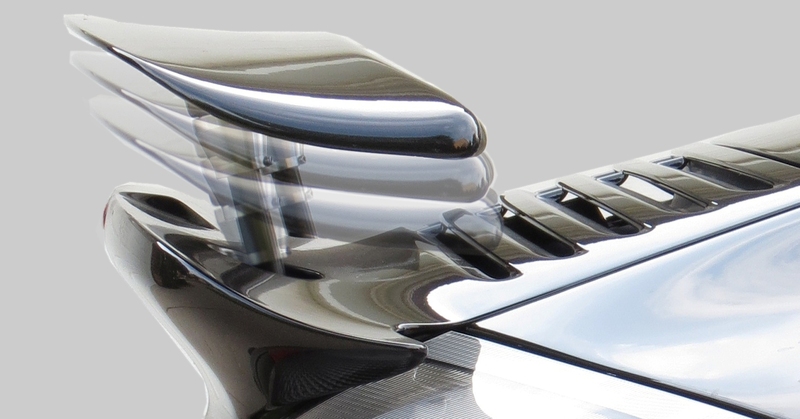 Superior aesthetics – you can readily see the wing deploy in the rear view mirror, observers can easily see your raised wing on the street or track. Perfect for owners that track their car. Note: When parked, the wing rests 3/4″ above the rear ducktail spoiler. 4 3/4″ [119mm] eRam Kit™ for 996 Turbo with a 997 Turbo Wing. 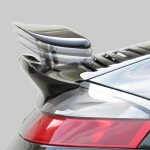 FOR THE FIRST TIME, A 997 TURBO WING CAN BE MOUNTED ON A 996 TURBO! 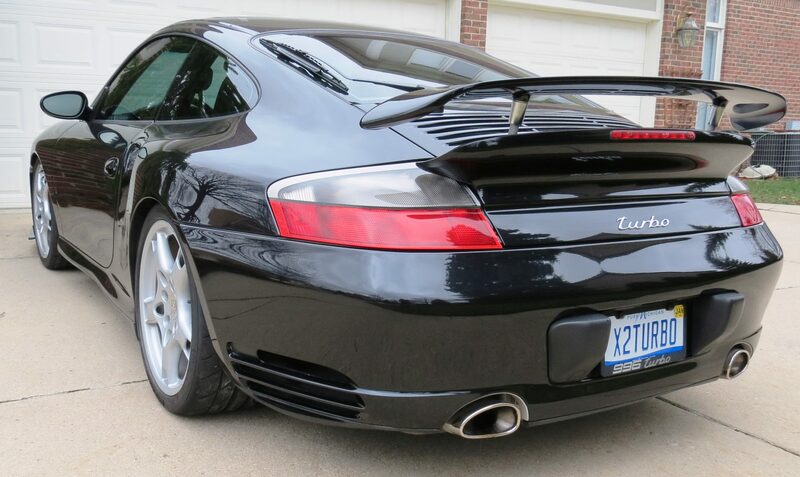 Note: 997 Turbo Wing not included (check eBay or a forum for wings). When down, wing is 3/4″ above ducktail. 4” [100 mm] eRam Kit™ is “aggressive yet not excessive” and provides good aerodynamic benefit, as the wing is up in cleaner air. Improved rear wheel down force at high speed. This eRam Kit™ raises the wing 4” above the parked position when deployed. For the 996 Turbo coupe, a full 1.6” [36 mm] above stock height. You can see the raised wing in the rear view mirror, observers will notice your raised wing on the street or track. 3” [75 mm] eRam Kit™ offers some improved aero-effect down force and aesthetics compared to the stock mechanism. This eRam Kit™ rises 0.6” [15 mm] in height over the stock 996 turbo coupe’s extended wing . This is also the closest eRam Kit™ to the Cabriolet factory raised height. This is a popular eRam Kit™ for those who want to retain more of a stock feel, with a nice look when the wing is extended. 2” [50 mm] eRam Kit™ an most economical solution for those who want to retain the 996 Turbo’s modest factory wing extension height and look. An economical choice for replacing a dead factory hydraulic system at about half the cost of a new factory mechanism – with all the added eRam Kit™ benefits. Quit spending time, effort and money on the troublesome factory hydraulic wing mechanism. Why risk hydraulic failure and subsequent leak of corrosive (and flammable) Pentosin® power steering fluid all over your motor or back bumper? The original factory hydraulic system can be rebuilt, but can NEVER be prevented from failing or leaking fluid. There are far too many things that can and will go wrong. The robust all-electric eRam Kit™ can never leak and eRam Kit™ parts are easily removed with standard tools for servicing or upgrading. The ONLY all-electric turbo wing actuation set (US patent issued). 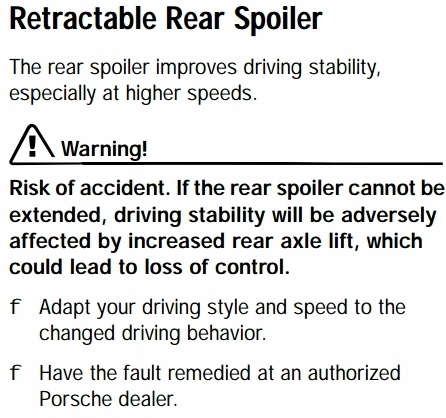 Even PORSCHE® dealers are getting in on this! Preassembled with everything needed: eRam Kit™ and MicroModule Device™ spoiler warning prevention electronics, connectors and all hardware. Under 2 hours for removal of the old hydraulics and installation of a new eRam Kit™. Robust – the self contained electric rams are designed for desert duty and have a duty cycle equivalent to stroking every 6.5 minutes for 10 years! Exactly like factory system: Up at 75 MPH, down at 37 MPH, or by using the dash switch to raise or lower. Four Extension Height Choices: 2 inch (like the coupe), 3 inch (like the cabrio), 4″ for better downforce and the new 4-3/4 inch (maximized downforce at high speed – like GT3 and GT4 wings). Two Deployment Speeds: Standard and SuperFast Version™. The SuperFast Version™ eRam Kit™ is 4 times faster at deploying the wing up or down. For example, the standard 4″ or 4-3/4″ set takes 11 seconds to go up or down. 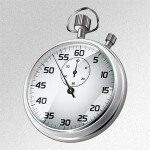 The equivalent SuperFast Version™ takes just over 3 seconds! Desired by those that track their turbos. Get to NEGATIVE LIFT FASTER! Simple Installation – Most customers install the eRam Kit™ themselves. NO MODIFICATIONS to your Turbo (no drilling, machining, filing, etc.) Remove the old mechanism, remove 1/4 turn lugs, bolt on eRams, wire up and put the wing back on – it’s that simple. Illustrated step by step instructions sent upon purchase. Don’t feel you have the mechanical aptitude? Have one of our RENNKIT™ PREFERRED SHOPS put the kit in – you can find them HERE. Light Weight – Saves PRECIOUS WEIGHT at the very top back end of the Turbo – 1/3 LIGHTER compared to the OEM hydraulic mechanism. Reduces center of gravity at the very back of the Turbo. Cost Effective – when compared to a new OEM system from Porsche®, a much better bargain – with all the benefits of a much more robust and trouble-free system. NO other wing actuation system compares in value. 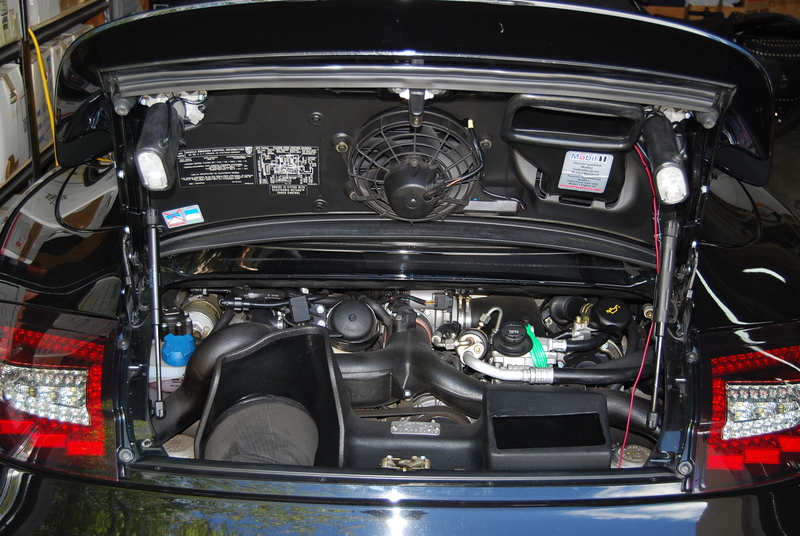 Safer – Why risk a flammable/corrosive Pentosin® fluid leak into the engine bay or down the back bumper. 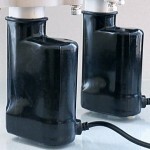 Get rid of hydraulic troubles for good! No worries – Two year limited warranty to original owner – see bottom of PURCHASE page for details. Wing operation with an eRam Kit™ is identical to the factory system; either by using the dash switch or when driving. Automatically deploys the wing up after reaching 75 MPH (120 km/h) and back down once at 37 MPH (60 km/h). The self-contained motor driven electric rams are designed for harsh environments and are protected from moisture or water with a dual-seal design. Adding the recommended Dust & Moisture Boot set protects the rams from dust, moisture and harsh engine bay conditions. Cycle Time Standard eRam Kit™: 4″ kit < 11 sec., 3″ kit < 9 sec., 2″ kit < 7 sec. Cycle Time “SuperFast Version™“: 4″ kit < 3 sec., 3″ kit < 2.5 sec., 2” kit < 1.7 sec. The eRam Kit™ is designed for harsh environmental conditions. We have a tight specification for the electric rams. If you used your Turbo as a daily driver 5 days per week, and took 4 trips per day on a highway so the rams cycle 8 times, that would be 2,000 cycles per year, or 0.23 cycles per hour on average. The patented eRam Kit™ has a very conservative 25% duty cycle. Thus, you would be able to safely cycle your wing 300 times per hour. This equates to a 1300:1 safety factor on an already conservative duty cycle! Many eRam™ sets have been purchased by owners that track their Turbo. Faster lap times have been reported. The eRam™ kit performed flawlessly during multiple high speed trials over 200 MPH! Track guys usually opt for the 4″ eRam™ system as they want the factory look when down, but the benefit of better down-force at the track. Height is similar to the GT3 and GT4 wing. Wing operation is stable with smooth and precise actuation. Street or track, operation is exactly the same. Note our track car has the flexible AERO-SPLITTER in the front (about $100 on eBay) – a nice balance to the higher rear wing! Quicker lap times were achieved with the 4″ eRam Kit™ installed. For the 996 Turbo, the wing rises 1.6″ [36mm] higher – in cleaner air for greater down-force at the back. SuperFast Version™ option reduces up / down stroke time significantly. The wing travels up or down faster than the factory mechanism. The 4 3/4″ or 4″ eRam™ actuation time is reduced from 11 seconds to just over seconds. The 3″ stroke time is under 3 seconds, while the 2″ eRam actuation time is less than 2 seconds. Order this option to get SuperFast Version™ electric rams. Dust & Moisture Boots protect your eRam Kit™ investment. These are a safeguard for keeping the eRams dry, dust free and looking like new. When ordered along with an eRam Kit™, they come pre-installed. They can also be ordered separately and put on later. 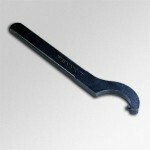 Pin Wrench: This tool is a must for removing the factory wing from the factory hydraulic rams. Engaging the pin through the outer cylinder and grasping the inner slotted washer is necessary. For the 997 Turbo wing; they used a strong thread locker at the factory – having the right tool to remove the wing is a must. Makes the job of removing the wing as easy as possible! Heavy gauge blackened steel finish. Imported from Germany. MicroModule Device™: Included with every eRam Kit™, this can be purchased separately to prevent the spoiler warning on Porsche 996 / 997 Turbos with fixed wing installations. 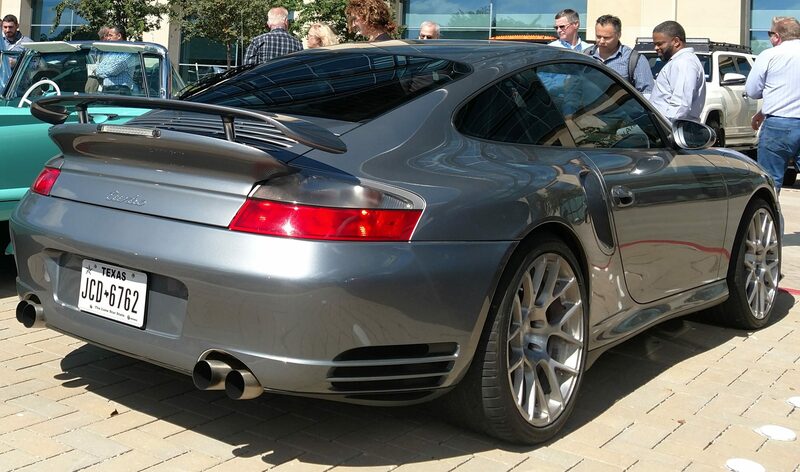 For 996 / 997 Turbos that have the GT2 / GT3 / Aero or after-market integrated wing & engine lid. Less costly than a new GT2 / GT3 wiring harness! Stop the dreaded Spoiler Warning for good! 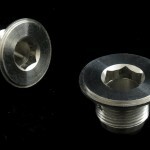 996 Turbo Threaded Wing Lugs: Your dealer cannot supply these items for the factory wing. 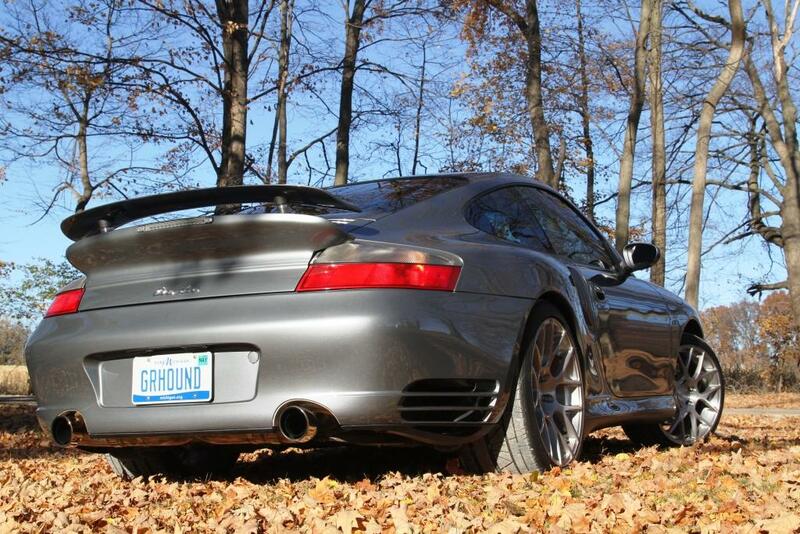 Often owners convert their 996 Turbo back to a working wing system, but the used wing they bought has no threaded lugs. This part is for those who need new threaded lugs to mount their factory wing to the eRams or the factory hydraulic system. By Black Market Racing. Custom Height eRam Kit™: The eRam Kit™ lowered or extended height can be adjusted to any bottom or top stop point between 0″ (0mm) and 4 3/4″ (119mm). For example, to keep the exact stock raised height on either the coupe or the cabriolet. Also the perfect solution for aftermarket wings with longer attachment bosses on the wing. WARRANTY: No worries, there is a 24 month limited warranty on all parts, and a money back guarantee for uninstalled kits (less nominal restocking fee) – click on PURCHASE and scroll down for details.